‘Part One: The Men and the Maggots.’ The words are rendered in tall, heavy text. White against black. Spartan, unflinching. Unluxurious, unadorned. Simple, functional. Scene One: water swirling; waves exploding over Odessa’s causeway. The causeway is strong and solid—but it functions only when the Black Sea ebbs. And now the Sea threatens to overflow. It will be relentless when it does. And always will the Sea so threaten, because always will there be this Sea, in this place. It retains its character. It will rise and rise and rise again. 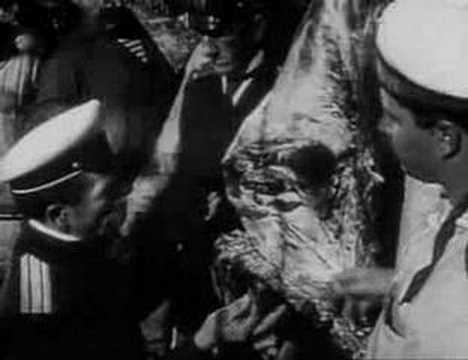 There is no object, person, nor bit of terrain in Sergei Eisenstein’s Battleship Potemkin that is not punctured with meaning this way. A pioneer of montage, Eisenstein saw the emotive power of setting disparate images side-by-side—even making them ‘collide’ if a shocking effect was sought. It often is here. One of the great propaganda films, Potemkin is all about heightened emotion. It never really relaxes; its quiet moments are like held breaths; like pulled bowstrings. Struggle itself is the star of this film, and the director embeds it in different ways, in different orders of magnitude, throughout—from the most macro: a standoff between sea vessels, to the most micro: a side of beef teeming with maggots, and the mutiny it sparks. 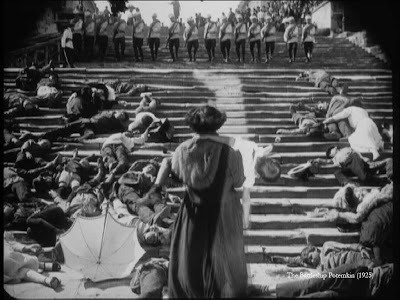 Like Tsarist Russia itself, the battleship Potemkin is divided by class. The crew sleeps in the bowels of the ship, suspended in hammocks that sway in rhythm with the sea. The officers live better, though they aren’t better men—we see one stumble like a fool as he navigates between the hammocks. His bad sea-legs frustrate him; he whips the back of a sleeping sailor, who was merely resting. The sailor is beautiful, bare-chested. The officer is overdressed; you’d call his moustache silly if you didn’t know it stood for power. On-deck hangs the side of beef, with the maggots writhing on it. The ship’s puny doctor, Smirnov, is unsympathetic: he tells the crew to wash the meat in brine. The men boil. The meat is turned to soup. The soup boils. The soup sits in big pots on long benches, hanging from the ceiling, swaying with the sea. The men refuse it. The Potemkin’s captain orders them shot. A harsh life is fraught with harsh punishments. We see the offenders crowded in one corner of the ship’s bow, covered with a tarp; watching, in one row, are the smiling officers; in another row, the other crewmen. Eisenstein presents them more as groups than individuals; there are many close-ups, but each reinforces the common attitude of the group to which he belongs. The only exception is Grigory Vakulinchuk (Aleksandr Antonov). He is the man who articulates the rebels’ vision. He is the one who cries out to his ‘brothers,’ the row of gunners preparing to fire. Suddenly, none of them can shoot. It’s mutiny. The battle itself is thrilling. 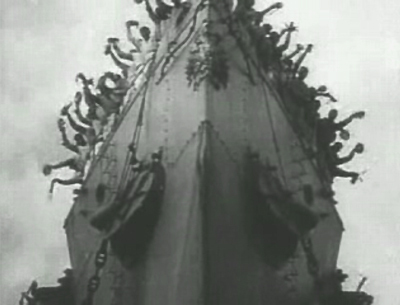 Eisenstein makes it seem as though the Potemkin has thousands of crewmen—as though it’s fit to burst. Crowds of mutineers push into tapering spaces; lines of men stream in opposing directions, deck over deck; rows of them pass under bars and beams. They crawl over the ship like the maggots over the meat. They use their numbers and their brawn to hurl their oppressors overboard. They are liberated. But Vakulinchuk is killed. In need of supplies, and now on the run, the crewmen anchor their vessel near the port city of Odessa. They transport Vakulinchuk’s body to the shore in a small boat. There it lies in state, so to speak—in a ratty tent, before the water, holding a candle and bearing a note: “Killed for a plate of soup.” Soon the citizens of Odessa are filling every road, covering every bridge, pouring down Odessa’s massive stone staircase —a line of them snaking along the causeway—all in pilgrimage to the tent. Soon, we’ll see the Massacre on the Odessa Steps—Potemkin’s most famous scene, when Tsarist forces coldly gun down Odessit civilians, including children. One child will be trampled to death. Another, still in its carriage, will be sent tumbling down the steps after its mother is shot in the stomach. The scene plays on every heartstring, and it’s unforgettable; but you’ll understand it best by remembering what came before. Because, before the citizens were laid low, they formed a communist paradise. The working classes who cheered the sight of the Potemkin, just offshore, found their voices joined by those of the middle class (parasols and all); and by the dregs, like the legless vagrant who held high the woodblocks he used for feet. The People were smiling and united. They moved as one body in support of the Potemkin, sending out their boats to restock it with food. Was this a preview of the ‘classless society’? In this sequence—only here—did Eisenstein show us men and women of different classes thinking with like minds. This dream is destroyed when the Tsarists open fire. But the Potemkin itself fires back, blasting Odessa’s Opera House, collapsing the walls of this ‘enemy stronghold.’ Eisenstein cuts between explosions and shots of elegantly carved cupids and leonine statues—which seem frightened, somehow. The lesson is simple: Bolshevik guns are vengeful, but they only attack the state. Tsarists kill children. The Revolution is Retaliation. Had you watched all this in 1925, with a quarter-century of capitalist-caused chaos behind you, Battleship Potemkin might have been convincing. Nearly 100 years further on, we call it naïve. But what this film can still do, astonishingly well, is show us the revolutionary potential in all things. From small to great—from the deck of a ship to the steps of a city. And finally, to the sea itself, when a squadron of Russian vessels train their guns on the lonely Potemkin. The squadron has power, but the Potemkin has justice, and again, those with the guns cannot fire. The People win. The film’s last shot shows the cheering revolutionaries aboard their vehicle of revolution. We see them from beneath the bow. The ship towers over us, impossibly tall; it bears down on us, overwhelmingly heavy. It pushes into us. And then, blackness. I saw Bronenosets Potyomkin at the Bell Lightbox; the film is part of the Toronto International Film Festival’s (TIFF’s) ‘Essential 100’ series. It’s also available on a two-disc DVD set (and on Blu-ray, too) courtesy Kino International. 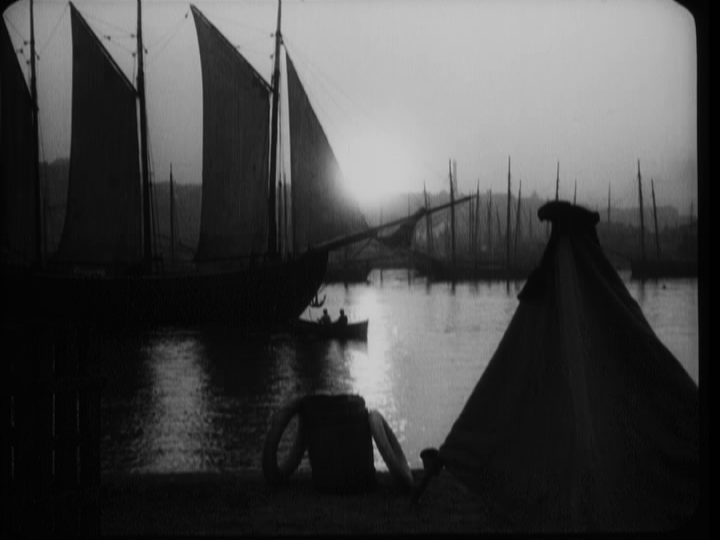 Interestingly enough, I just today posted something on BATTLESHIP POTEMKIN on my blog. I first saw this in a film class back in the late 80's, then in ANOTHER film class in the early 90's. That's how important a film it is. Nowadays, I can enjoy it without having to take notes all the time! Very good write-up, BTW. I'm a fan of silent cinema, and will certainly be checking back here often. Great post! 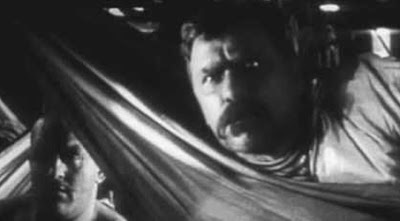 Please e-mail me at chrisc@moviesunlimited.com when you get a chance, I'd love to discuss reprinting this piece at http://www.moviefanfare.com, as Battleship Potemkin is a landmark moment in cinema that our readers would love to learn more about.